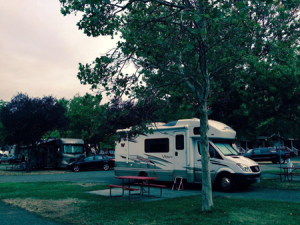 About RVs and RV travel. Marilyn and I have been around RVs our entire lives. As youngsters our families had lots of different rigs. We have been in popup tent trailers, cabover campers, travel trailers and motor homes. RVing is not for everyone, but for some it is a wonderful way to go. Right now we have a fairly new Winnebago 24 foot Class C diesel motor home with one slide out. It is nice for shorter trips of around one week to maybe a month at the longest. **We just got back from a week up on the lower Rogue River, right on the Oregon coast at Gold Beach. Our friends, John & Dea Hogg, met us there with their new Chevy 4 door, 4×4 pickup pulling their new 20 foot light weight travel trailer with one slide out. John and I went out early fly fishing every morning for Steelhead on the first 30 miles of the river. The water was a little warm so we did not do really well, but did hook some smaller ‘Half-pounder’ Steelhead every day. One afternoon the four of us took the famous jet powered Mail Boat ride up to Agness for dinner. Another afternoon we took a long ride up the coast highway to Bandon.